The snub of progressive rock pioneers Yes by the Rock and Roll Hall of Fame outraged fans. 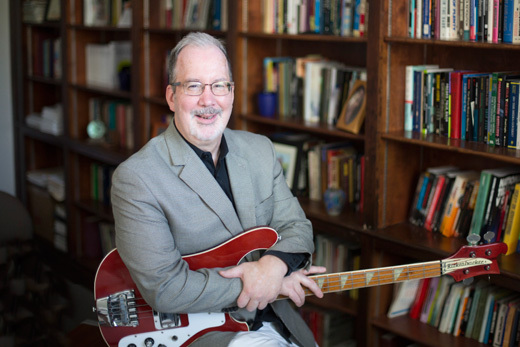 Emory sociologist Timothy J. Dowd examines how critics inside and outside the prog rock scene go about evaluating the music. To fans, the snub of progressive rock pioneers Yes by the Rock and Roll Hall of Fame is an outrage that ignores the genre’s complexity and one-time music scene dominance. The Hall of Fame, which hosts its 2016 induction ceremony April 8, in turn has defended itself and the rejection of Yes by saying critics have been mixed on the genre and that prog rock’s status is a reflection of the changing history of rock itself. A new paper by Timothy J. Dowd, chair of Emory College's Department of Sociology, sees a bit of truth in both of those views. In his article "Talk of Heritage," Dowd examines how critics inside and outside the prog rock scene go about evaluating the music. Progressive rock peaked in popularity in the 1970s and 1980s with bands such as Genesis, Pink Floyd, King Crimson and Emerson, Lake and Palmer, but is still being produced today outside of the mainstream. It is defined by its complex orchestrations and incorporation of other genres, such as jazz and classical music. Dowd and his colleagues relied on digital techniques to capture patterns among more than 3 million words found in 5,118 reviews offered by prog rock specialists. Given the fierce debate among rock music fans over Yes, it’s perhaps not surprising that Dowd found the specialist critics and mainstream reviewers don’t quite agree. "The question is, how does the greatest of all time become the greatest of all time," Dowd says. "We want to understand that process for progressive rock, for classical music, or for any musical form that is sustaining itself." By focusing on prog rock in this particular study, Dowd is especially interested in what he calls "consecration" — the way that creators and the work are celebrated decades or centuries later. The presidential primaries have nothing on dividing Americans the way progressive rock does in music circles and among rock fans. Dowd’s paper shows mainstream critics are likely to see value in the first groundbreaking acts to blend historical music such as classical and folk to create symphonic rock. Conventional wisdom says punk later pushes the classic acts — exemplified by Yes and others — out of the limelight. But the fans, whom Dowd calls insiders, see prog rock as a vibrant, evolving genre that is able to constantly move forward. Those insiders took over the care and feeding of prog rock when mainstream attention died away. They focus on the same heritage as the mainstream critics but also have better access to the contemporary music scene that developed from their care. "The way in which insiders can seize upon canonical greats is due to the do-it-yourself preservation of the history and ongoing creation of new recordings," Dowd says. Dowd, who teaches a sociology of music class for Emory College students, is an ideal source on such music studies. A classically trained pianist, as well as an electric bassist, he performed in a range of settings, from church services and weddings to work in rock and jazz bands. There was little call for progressive rock in any of those venues, though Dowd comes closer to that musical complexity these days by writing his own instrumentals that fuse rock and jazz. In his research, the focus is on how those who concentrate on music professionally are able to continue as musicians, especially in a genre out of the mainstream. His findings about the insiders’ efforts could give hope to prog rock fans in general and Yes in particular. Yes was rejected on its second nomination, but has been eligible for Rock Hall enshrinement since 1994. Fellow prog rock icons Deep Purple have been eligible for the Rock Hall since 1993 and will be inducted this week after their third nomination. "There is a lot of openness about what is progressive rock these days," Dowd says. "I see cases that help me understand the process of evaluating it. Prog rock is still marked by the ability to play."